Where does a novel come from? What mysterious amalgamation of reality and whimsy come together to form the nucleus of a tale that creates a world of its own? A place that the reader can enter, like Dorothy opening the door of her Kansas home, to reveal Munchkinland in all its Technicolor brilliance. Did you hear about the Jacksons? 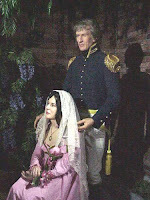 When General Andrew Jackson, the hero of New Orleans married his wife, Rachel she was still married to her first husband, Lewis Robards. The couple always claimed that Robards told them he had submitted the divorce papers. He, of course, denied it. Jackson remarried Rachel in 1794, but the scandalous accusations of bigamy scuppered his bid for the presidency when he ran in 1824. By the slimmest of margins, Jackson managed to win the popular vote and even gained the most electoral college votes. But without a clear majority it fell to the House of Representatives to name the new president. After only one round of voting, John Quincy Adams was named the sixth president of the United States. Four years later, the same ugly stories once more reared their heads. It’s said that throughout his life Andrew Jackson fought thirteen duels. Many of them over his wife’s honor. This time, however, Jackson had the satisfaction of soundly thrashing Adams in the race for the presidency. Unfortunately, just two weeks after the results were known, and before her husband took office, Rachel Jackson died. Andrew Jackson blamed the scandal mongering and never forgave John Quincy Adams or his party. Did you know that Napoleon Bonaparte had American relations? It’s true. In 1803 Napoleon’s younger brother, Jerome was a naval officer fighting in the Caribbean. To escape captured by the English he retreated to America. While visiting a friend in Maryland he met Miss Elizabeth Patterson, the daughter of the wealthiest man in the state. After a whirlwind two-month courtship, he asked for her hand in marriage. 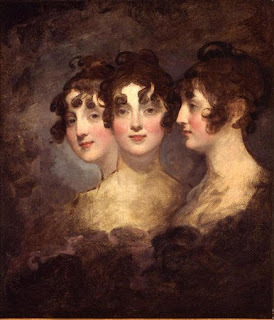 Neither side of the family was enthusiastic about the arrangement, but Elizabeth, known as Betsy, did manage to obtain her parents’ permission. Napoleon Bonaparte wasn’t so accommodating. The wedding went ahead anyway. The couple were married on Christmas Eve, 1803 by the Archbishop of Baltimore. Betsy’s beauty was legendary and she had no problem with flaunting it by wearing fashions that raised many an eyebrow. At the news of the wedding, Napoleon immediately ordered his brother home. They ignored the summons for as long as they could, but the time came when they had to respond. A now pregnant Betsy set sail with her husband, hoping to arrive in time for Napoleon’s coronation. When they came within sight of the coast in March of 1805, their ship was boarded and Jerome was taken off. She never saw him again. Jerome tried to reason with his brother, but Napoleon would not listen and declared the marriage null. He then demanded that Jerome marry a German princess Catharina of Württemburg. Jerome caved to the pressure and married the German, without having his marriage to Betsy legally dissolved. Napoleon sent a letter to Betsy requesting that she stop using the Bonaparte name, and offering her a small stipend if she would drop her claims, and those of her son. She promptly replied that she had come by the name honorably and had no intention of dropping it or any other right or honor which she was due. After the Battle of Waterloo she returned to Europe and was feted across the continent for her beauty and wit. She finally secured a divorce from Jerome in 1815 by a special act of the Maryland Legislature. Mary Stuart, Queen of Scots was at odds with her Tudor family from the day of her birth. Proclaimed queen of Scotland when she was less than a year old, she also had a strong claim to the English throne. Her mother was Henry VIII’s sister. 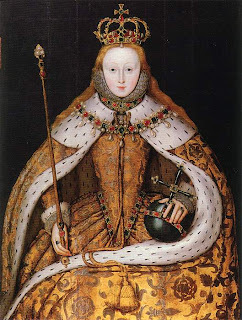 When the English throne devolved to Elizabeth Tudor, her mother’s marriage to Henry had already been annulled and her legitimacy denied by the English Parliament. Henry tried to fix the problem by unequivocally stating the line of succession in his will, but that patch was too little too late. Thus the stage was set for a battle of wills between these first cousins, both of whom were reigning queens. Unfortunately for Mary, Elizabeth had the upper hand. England at the time was more prosperous and more populous. It was strong militarily and had the advantage of a centralized government that made its sovereign less dependent on her conniving Lords. One of the major sanctions that Elizabeth imposed upon learning that it was Mary’s intention to marry again, was a demand that she have a say in the selection of husband. The last thing she wanted was for Mary to form an alliance with a Catholic prince and thereby gain preeminence. When asked whom she had in mind, she actually suggested that Mary marry Robert Dudley. And this is where Elizabeth’s world began to dissolve into fantasy. He was her favorite courtier, and a man most historians assume to have been her lover. Gossip was as rife then as it is today, and Mary was more than offended at the suggestion, but for political reasons acted as if the match might work. Elizabeth’s delusions seemed to know no bounds. It seems she regretted her suggestion, but could hardly tell Mary not to marry Dudley when it had been her idea in the first place. Her solution? She sent a letter to Mary, with the proposal that, once married she and Dudley should move to England and live with Elizabeth! Elizabeth would, of course, support them. Can you imagine such a proposal made to a reigning monarch? Not only was she supposed to leave the governing of her country to others, in order to mooch around Elizabeth’s court, but she was also, apparently supposed to share her husband with her first cousin. Yikes! I guess no one ever accused Elizabeth of not being a gutsy broad. Needless to say, this bit of fantasy on Elizabeth’s part was not fulfilled. Mary went on to marry an Englishman with a claim to the English succession that nearly matched her own. An alliance that produced an heir, but eventually led to her downfall. For some reason we often think of history as genteel and the people of previous angels as something different than full-blooded men and women. But human nature hasn’t changed. People were as complicated and conflicted then as they are now. Writer question: What sort of things spark a story for you? Reader Question: Have you ever thought you might have found the snippet of idea in a book that sparked the whole story you were reading? Everyone Question: If you were Mary, would you have wanted to shove that letter down Elizabeth’s throat? I've read a lot of books about Elizabeth too. She's a very intricate character. I go back and forth between admiring her and being appalled. I've always been fascinated by Medieval history. Don't really know why. In highschool I loved Chaucer and the Decameron. I think they sparked some ideas for me. Then later in life I took grad level poetry classes and discovered the medieval mystic writers. That drew my attention back to this time. I also hate doctrinal and denominational divisions, so when I finally decided to write my first novel, I recall thinking that I wanted to go back to a time in history when there was still one church, and sort of rediscover true Christianity in different terminology. So those are some of the things that drew me to that time. I've discovered lots of great tidbits along the way that have enriched my stories. As for plot ideas, honestly, mine usually just come to me out of "nowhere." I like to think that God has a hand in it. In fact, I usually start with a premise, so I have to work hard to make sure I have enough plot to sustain it. For the first book, I felt like God sort of handed me the plot along with the premise, but for the second two novels I've had to come up with them on my own, and that's been very challenging. One of my story ideas came from family history, but many times it is an obscure newspaper story from the era I want to write in that sets me to spinning "What ifs." I love reading old newspapers, so that makes it fun. It also keeps my plots from being "out of line" historically. Wow, great post. I loved the information. I could easily become lost in this stuff. My current WIP came from the purchase of an obscure non-fiction book. $5.00 on the clearance table at B & N.
Thanks for some 'inside' facts, Lisa. Seems just in the last months I read a story where the American Mrs. Bonaparte came up. I didn't think the author made THAT up, but sometimes we do, eh? Thanks everyone for stopping in! DIna you're right, there's much to admire about Elizabeth, but I don't think I'd have liked her very much. She was one of those complicated "House" characters. D'Ann-I'm totally with you on the old newspapers. My only problem is that I've finished a manuscript still been fascinated, done more reading, found a gem and of course that needs to go in. Or worse it changes something already in there. research really is an addiction for some of us. This morning while I was cleaning the kitchen, I listened to a Fox News report about a guy who'd been kidnapped and beaten before escaping. The cops pretty much decided it was a case of mistaken identity. My writer's mind started thinking about the possibilities. Very informative blog post, Lisa! Dina, if you want to read about a time when there was only one church (no denominations), buy a copy of PAGAN CHRISTIANITY by Frank Viola and George Barna. You will be amazed (and probably even disgusted) at the historical beginnings of church traditions, such as dressing up for Sunday, tithing, pulpit sermons, and even the use of temples. Wonderful bios and I can see how they spark your interest. I love reading historicals but write contemporaries. My story ideas come from thin air. Can't pinpoint how but characters just start to come to life in my imagination. And DO read pagan Christianity. It will fundementally change (in a good way, I think) how you relate to church. I don't necessarily agree with the authors' conclusions, but reading the book certainly stripped away a lot religion from my faith. It's interesting how much we take for granted. Sometimes we think what we were taught in history class was all that happened. And sometimes we assume the traditions of the church are on par with the doctrine of the church. Could be that a study of history can change our perspective on a lot of things. Good food for thought! What a fun post, Lisa! I knew nothing about Betsy Bonaparte. Wow, her story would make for a fabulous novel. Elizabeth...yeah, I vacillate between admiring her and thanking God I wasn't a member of her household. I think she'd have scared me, LOL. Old newspapers are fabulous for sparking ideas or providing info for my stories. God often uses music, of all things, to spark stories in me. I'll be listening to something, and then I'll get a scene in my head (which has nothing to do with the lyrics, but I think the themes or tunes often make me feel a certain way and my imagination feeds off of that). White Heather came about that way, and I envisioned two different scenes involving the hero, who is a secondary character in another story. I had to figure out how to tie those scenes together, but it was fun! I also enjoy looking at sketches or photos of historical costumes, jewelry, household items, etc, and I'll wonder what the story is behind them. Who owned that? What was their life like? Great stories! The series I'm working on was inspired by a trip to a historical place. Another book idea I'm tossing around came about as a result of a brief conversation with an elderly man. I wish i knew where the novels came from, I sure would like for one to pop up in my head. I love to read but can't write well enough to do a review, I want to give the plot away. Oh well we all can't be writters. Great post kiddo! I'm so glad I wasn't Elizabeth's sister. I never knew that about her. And you're right, the people of history weren't any better in there days than we are in ours, but somehow I always thought they were more innocent;not so. Wenda, I love how you summarized PAGAN CHRISTIANITY: "...but reading the book certainly stripped away a lot religion from my faith." Once I finished reading that book, I started THE END OF RELIGION by Bruxy Cavey. While I don't agree with everything I've read so far, his words have provoked lots of thought on my preception of Jesus because of what I've been taught at church and on my realization how naive my perception has been. I like how one blogger summarized the book: "In The End of Religion, Cavey contends that the Jesus described in the Bible never intended to found a new religion; instead he hoped to break down the very idea of religion as a way to God. With a fresh perspective on biblical stories, Cavey paints a picture of the world God originally intended and still desires: a world without religion." Anyhoo, last Sunday I told the kids they could wear whatever they wanted to church as long as it wasn't inappropriate, like wearing a bathing suit when the temperature is a whopping 14 degrees. So middle child put on a pink dress shirt and khaki cargo pants. Not overly matching, but not bad either. But then as we were leaving the house, I noticed he had a green Aeropostle t-shirt on underneath the relatively thin pink shirt. Took all my self-control to tell him not to go upstairs and change. When I asked myself, "if someone else's kid were wearing that on Sunday morning, would you think he was dressed oddly?" Nope. I wouldn't have given it a thought. Daughter and I both freaked out. She was leading the dance, but ditched us all to run back stage and search for clothes. Miraculously she found a pair of jeans that almost fit him and cinched them around the waist with a ribbon. So off topic. Sorry, Lisa. Thanks ladies for carrying the conversation while I was away from the computer. I came home one day to find my husband had dressed my 2 year old son in a shirt that was not only inside our, but upside down. Don't even ask me how, it's a mystery. Susanne, I love the idea of music sparking a story. I guess it does for me in a way because I like to write to soundtrack music. No words, but the dramatic rush of sound definitely puts me in the 'write' mood and keeps my fingers flying on the keyboard. Thanks to all of you for stopping in today! LOVED this post! My brain works like yours. It's that one image that captures my heart, mind, and soul. A young Irish girl, hearing, "The little eejit's got to go," and realizing SHE is the "eejit" (idiot). Big ideas. Big pictures. Big novels!! Thanks, Patti. The creativity of the human brain is such a wonder! I love that spark taht sets the fire of a new story burning. For me, I just know when it's one of those special ideas, the ones that can support a whole novel. The best rush of all! Shhh. Don't tell the pastors, but I get my best ideas while "listening" to sermons. And, of course, songs and images and family stories spark the creative energy, too, but I do my best mind writing in church. Is this true confession time, Mary? I think it's called "Being still, and knowing" or something like that. Holy Inspiration!